Well, this is a tiny little picture in comparison to the two-foot-tall original, but here are a few shots of the painting I'm currently working on. I can say 'currently' because I worked on it yesterday for the first time in two months. *sigh* I so wish I had more time to paint...I really need it. Just as an FYI....the gap in the middle of the bridge is intentional, as the bridge is broken there (see detail pic beloew). The gap on the far right, though, isn't supposed to be there and will be covered up at some point. 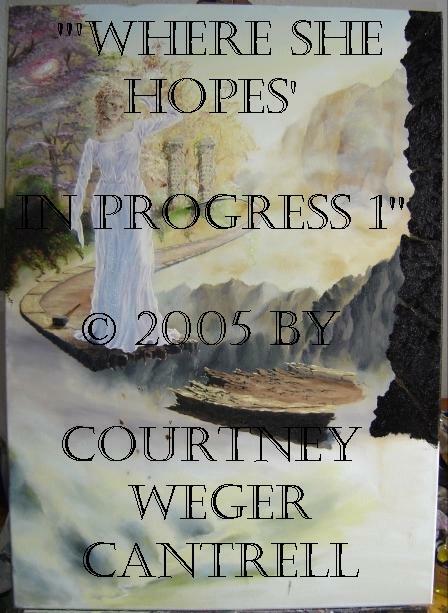 "Where She Hopes" is very much a work-in-progress: the foreground isn't finished, the trees in the background need work, the stone pillar on the far right is incomplete, and even the girl needs touch-ups. So, though feedback is welcome, please reserve judgment till you see the final product! 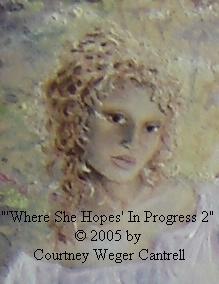 A close-up of the girl, though the image quality isn't the best here, either. The painting isn't anywhere near this blurry in real life. Oh well, at least this gives a better impression of her facial expression. The hair was fun to paint. ;o) I think I spent more than two hours on the eyes alone! 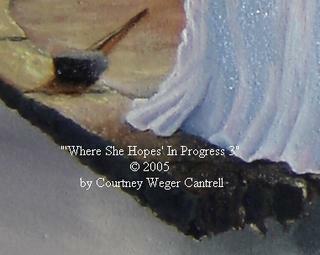 This is one of my favorite sections in the whole painting so far. I'm just really pleased with how well the sledgehammer and the shadows turned out. Last but not least, a detail pic of the broken bridge. I had such a blast painting the cracks in the stone! It was an intimidating task at first, but I loved it once I got into it. This morning, I'm briefly pondering how so many Christians are willing to discard the abolsute truths in God's Word in favor of "acceptance" and "tolerance" and "being non-judgmental". It seems that more and more Christians are choosing the ecumenical over the scriptural. I find that scary and way too post-modern. Be open-minded. But not so open-minded that your brains fall out. After seeing the movie 'Benny & Joon' several times, and then buying it on DVD a few months ago and watching it at home, I’ve decided that this is one of my all-time favorite movies. The actors all give terrific performances, and Johnny Depp is just spectacular as Sam. I’ve also decided that Depp is one of my favorite actors: He’s one of very few actors so flexible and so un-typecast that he can perform a huge variety of roles. Watching him act is a pure pleasure; he *is* each of his characters in a way most actors aren’t able to be. Those of you who know me well know how much I love quotes. I actually sat down and watched ‘Benny & Joon’ with pen and paper in hand, so that I could write down all the great one-liners. This movie always has me glued to the screen with fascination; wiping at a poignant tear; or rolling on the floor laughing. So here are some of my favorite quotes from ‘Benny & Joon’. Most of them are from Mary Stuart Masteson’s character, Joon. Enjoy! Have we an internal sequin issue to deal with, Benjamin? So, are you and Ruthie considering itemhood? Who died and made you Ed McMahon? Beware! The winds of reason shall blow stern! Benny: Did you leave the house alone? Will someone get some air to his brain? In Ireland, we have a saying: When the boat runs ashore, the sea has spoken! WARNING: This blog post is not for the faint of heart or weak of stomach! This is a picture of the nifty gadget that Ed bought me a few weeks ago. In my efforts to adopt healthier eating habits, I’ve been trying to eat more vegetables. Okay…I’ve just been trying to eat vegetables, period. Most of my life, I’ve been a meat-bread-potatoes girl, and green veggies have never been particularly appealing. But the last few years have taught me that wow! my body really does function better if I put fresh, uncooked things into it—the whole natural-sources-of-vitamins-and-minerals thing really is effective. God created broccoli and cabbage for a reason, it seems. Okay, so I’ve been trying to eat more veggies, which means salads for me. But there’s a serious drawback: Salad-making is, for me, a tedious process. Which means I’m less likely to do it. Not necessarily because I’m lazy (though I’m sure that’s part of it), but because I can always think of more productive things I could be doing with my time while I’m trying to turn that piece of tomato into something that could conceivably be called diced. So Ed bought me that nifty gadget, designed to lighten my load and goad me on to health and wholesome eating. This natty doodad slices and shreds and basically need nothing more than elbow grease and a good rinsing after use. As a result of its entry into our home, my salads have been looking more and more appealing, as well as being more enjoyable because I’ve been having oodles of fun preparing them. And when I have fun with food, it tastes a whole lot better. That is, until yesterday. The following picture shows what I did with my new toy yesterday. If you get all fluttery at the sight of blood, stop reading and looking now. This, friends and neighbors, is why Courtney generally stays out of the kitchen. Bad things happen. Sometimes, things break. Sometimes, she gets things to catch on fire that aren’t supposed to be flambéed. Sometimes, she hurts herself. This is why she leaves the cooking to Ed: because while in the kitchen, she doesn’t pay enough attention to be trusted with sharp objects. It was really my own fault, because I got a bit too enthusiastic with the slicer. I’m fortunate that I didn’t do more damage; that thing is razor-sharp. I trust Larry when he says I don’t need stitches (not that there’s enough left to stitch together, anyway)…but this sure does hurt. Even under pressure, it took two hours to stop bleeding, and then I made it start again when I put a bandage on it before going to bed. And it’s on my right hand, which means that I’m now slightly impaired. I brushed my teeth with my left hand this morning, I can’t shower properly, and right now I’m having to hunt-and-peck a great deal more than I usually do when typing. And it’s my middle finger, too, so when I’m holding my hand up in order to make the throbbing stop, I have to be careful not to flip everybody off. Back in December, I wrote a list of “a few things that tick me off”. Since then, I’ve been meaning to sit down and compile a list of positive stuff in my life. Yesterday, I led part of our ladies’ breakfast devotional on thankfulness…so I figured it was high time for me to blog about a few things in my life with which God has blessed me. This is a pretty random list...just involving a few things swirling around in my head. Though I haven’t worked on it lately, I’m still enjoying my newest painting. I started it, oh, six weeks ago, I suppose. If it turns out the way I imagine, it’ll probably be my best to date…and my most meaningful, because it expresses an integral and not always beneficial part of my personality. I’ll post a work-in-progress pic here sometime soon. God brought me to Saxony, and the Saxons introduced me to coffee. Coffee is wonderful. Coffee is great. Coffee tastes best with sugar and coffee creamer. YUM!!! Friends, I am pleased to tell you that IT IS FINALLY SUMMER HERE. In May, things started warming up enough to become slightly uncomfortable. (Well, not for me, but the rest of the mortals don’t seem to like the heat too much.) Then, it started getting colder again. Last week, we had temps in the 40s. That’s FORTIES. As I type this, it is 19:21 (FYI, that’s 7:21 p.m.) in Chemnitz, the sun is shining, and it’s 70.9 degrees Fahrenheit. Ahhh…… I went for an hour-long walk earlier and enjoyed thinking about God and watching the baby ducks in the big pond. More and more people are realizing that teaching someone about God doesn’t mean just having a Bible study with them. More and more people are realizing that teaching someone about God doesn’t require being in a paid position with a title. I’m so thankful that God gave me his Holy Spirit to live in me, guide me in decisions, and change me from the inside out. Without him, I would be nothing. I’ve been reading further in Strobel’s The Case for a Creator, and the more I read, the more fascinated I am. I know most people—including many Christians—find this stuff to be dry, boring academics…but I get SO excited about it, I just can’t keep my mouth shut! If I had been better in math and physics in high school, I seriously think I might have gone into a field of scientific study. So many Christians believe that science is irrelevant; that science can add nothing to their faith (that science will detract from their faith, in fact); and that science and faith are fundamentally incompatible. But I believe exactly the opposite: In Genesis 1:28, God commanded us to “be fruitful and multiply and fill the earth and subdue it…” Well, we’ve fruited and multiplied and filled, but we haven’t yet subdued. I believe that part of what God meant by “subdue” is that he wants us to learn and understand and benefit from his physical creation as much as we possibly can. This means learning from his physical creation. This means studying it. This means science. “Science and faith are not at war. When scientific evidence and biblical teaching are correctly interpreted, they can and do support each other. I’d say to anyone who doubts that: investigate the evidence yourself. “…And here’s what the scientific evidence for God does for me: it realigns me. It helps me recognize that despite my natural tendency toward self-focus and self-absorption, I can’t ignore what God has accomplished in this world to let everyone know that he is real, that he is the Creator, and that we need to get right with him. “I see this not only in cosmology and physics and biology, but also in the historical revelation of the Bible, principally in the revelation of Jesus Christ himself. He is so compelling! Einstein thought so. Napoleon thought so. This Nazarene captivated their attention, and he continues to captivate mine. “…Jesus is so beyond what I can comprehend! And the evidence for God in nature constantly challenges me to a deeper and fuller relationship with him. My study of the scientific evidence isn’t separate from my life as a Christian; it’s marbled throughout that experience. “…I look at the stars in the night sky or reflect on the structure and information-bearing properties of a DNA molecule, and these are occasions for me to worship the Creator who brought them into existence. I think of the wry smile that might be on the lips of God as in the last few years all sorts of evidence for the reliability of the Bible and for his creation of the universe and life have come to light. I believe he has caused them to be unveiled in his providence and that he delights when we discover his fingerprints in the vastness of the universe, in the dusty relics of paleontology, and in the complexity of the cell. “So exploring the scientific and historical evidence for God is not only a cognitive exercise, but it’s an act of worship for me. It’s a way of giving the Creator the credit and honor and glory that are due to him. To attribute creation to a mere natural process is a form of idolatry to which we’re all prone. I don’t judge my naturalistic colleagues for being prone to that. That’s how I’m constituted as well. All of us have a tendency to minimize God, to think and behave as if we weren’t really immersed in his creation and that we aren’t ourselves the product of his unimaginable creative power.